BosStrap has reengineered the BosStrap Camera Sling System with an improved one-piece design, the BosStrap OP Camera Sling. This strap incorporates a sliding fitting that moves along the strap, not requiring the strap itself to move. In use, the camera glides smoothly along the strap up to your eye; when not in use the camera rests comfortably at your hip. The one-piece construction of the BosStrap OP means you never have to worry about the camera becoming disconnected from the strap. Made in the USA, the BosStrap OP Camera Sling sells for $39.95 on the website below. January, 2012. BosStrap reengineered the BosStrap Camera Sling System with an improved one piece design, the BosStrap OP Camera Sling. 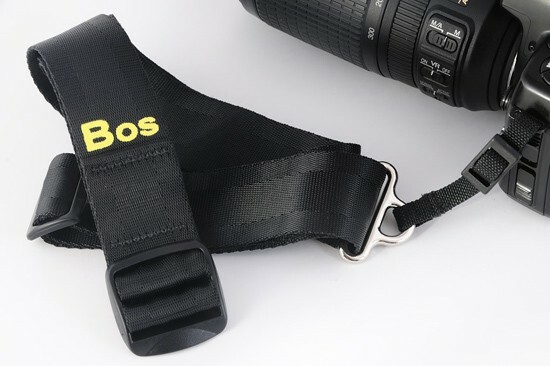 Like OEM supplied straps, the BosStrap OP always remains attached to your camera. But there are significant differences compared to conventional neck straps. Sling straps incorporate a sliding fitting that moves along the strap, not requiring the strap itself to move. In use, the camera glides smoothly along the strap up to your eye; when not in use the camera rests comfortably at your hip. The sling design dates back to 1885. • No fittings, buckles or screws to disconnect ever! • BosStrap is entirely made with USA parts and labor – right down to the thread! Put one on your camera and leave it on. BosStrap OP remains attached to the camera.